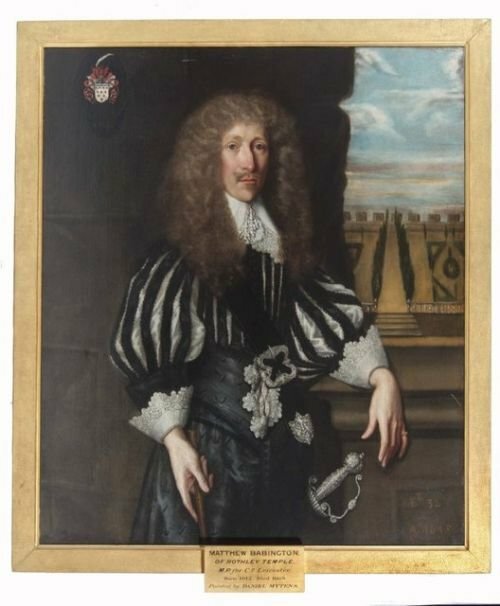 Painted by Daniel Mytens or one of his followers in 1645, Matthew Babington was a lawyer who was called to the bar in 1639. He must have done well during the war as he is expensively dressed in a black silk doublet slashed in the sleeves and body. 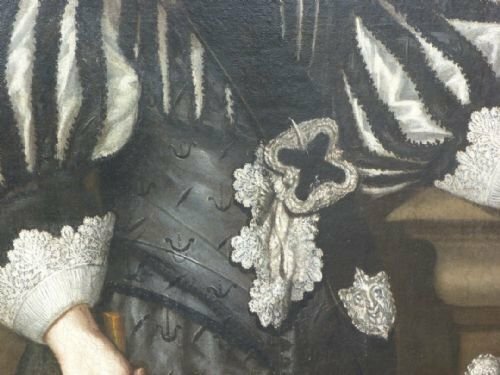 The tabs of the doublet are not slashed in the same way and have the appearance of a wide cummerbund across his waist. 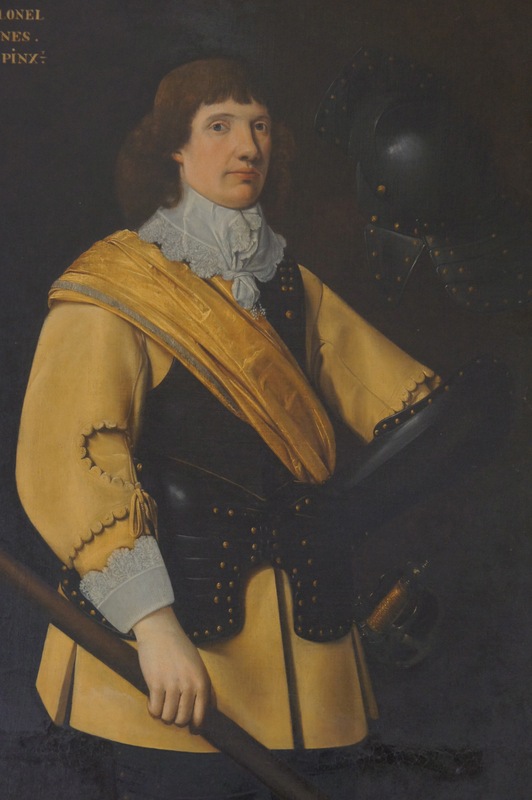 The silk that remains between the slashes is scalloped at the edges and (as well as that of the tabs and his black breeches) is stamped to make a pattern of figures across the suit. His linen consists of a laced falling band and cuffs as well as a shirt that is decorated with lace at waist level. It has been pulled through the gap between the two central tabs, rather an odd fashion though we have seen this before. The contrast between black and white makes it quite striking in this case. His sword baldric is decorated with a silver buckle and strap end. This picture courtesy of Roy Precious Fine Art and Antiques. 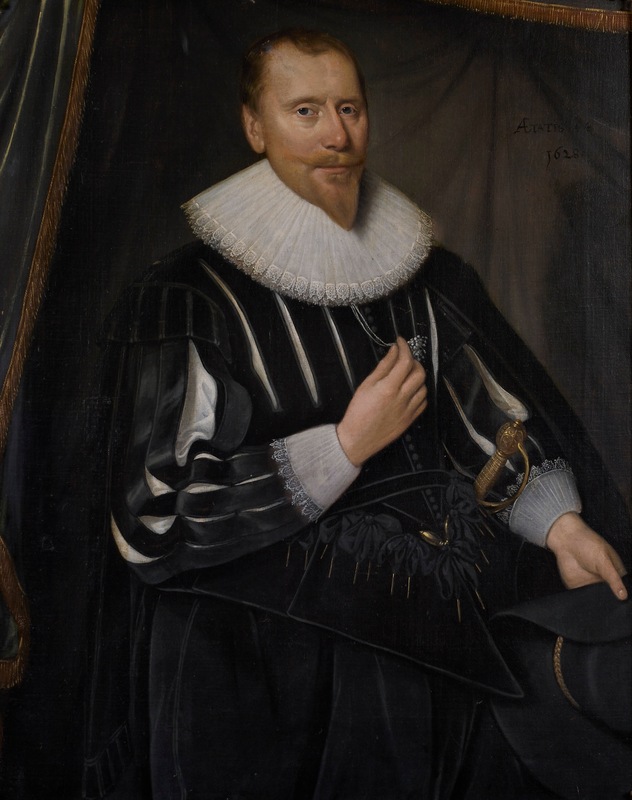 Painted by Daniel Mytens in the late 1630s going by the style of the doublet. This is a high class lad, the clothes are fine and well fitted. 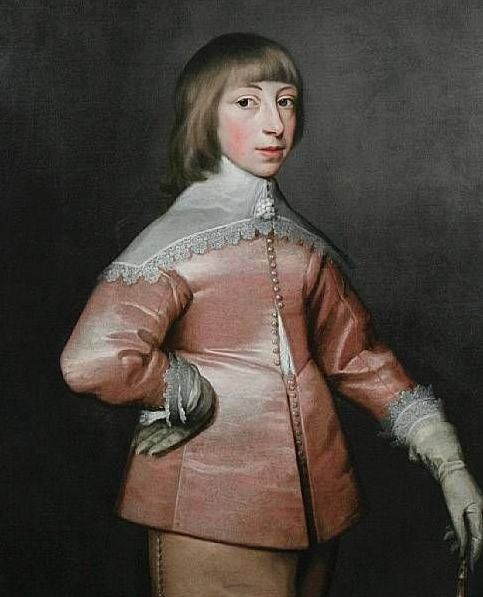 He’s wearing a pale pink silk doublet and slightly mismatching buff breeches, though it could be an effect of the light. His doublet is unbuttoned at the lower end to show off the fine linen of his shirt and to draw attention to the top of his breeches. In a decade the fashion would tend to unbuttoning the top of the breeches too, but pre war it was slightly more restrained. 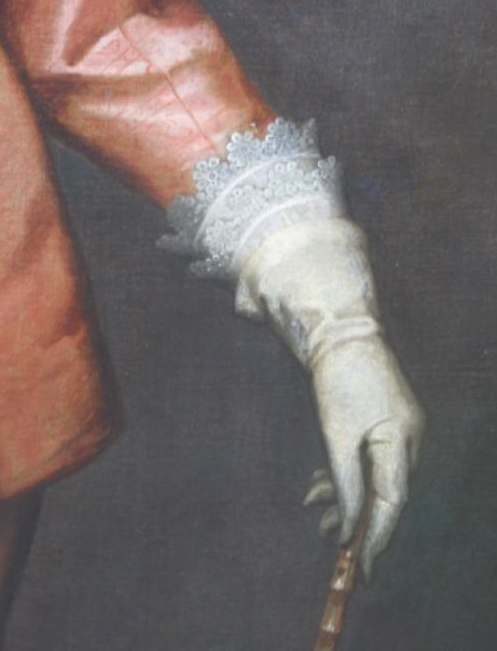 His cuffs and falling band are well laced, though if you look closely the types of lace aren’t exactly the same pattern. The portrait was sold by Roy Precious Antiques and Fine Art. He also has a fine pair of soft leather gloves. In terms that I would expect from a moderate parliamentarian. 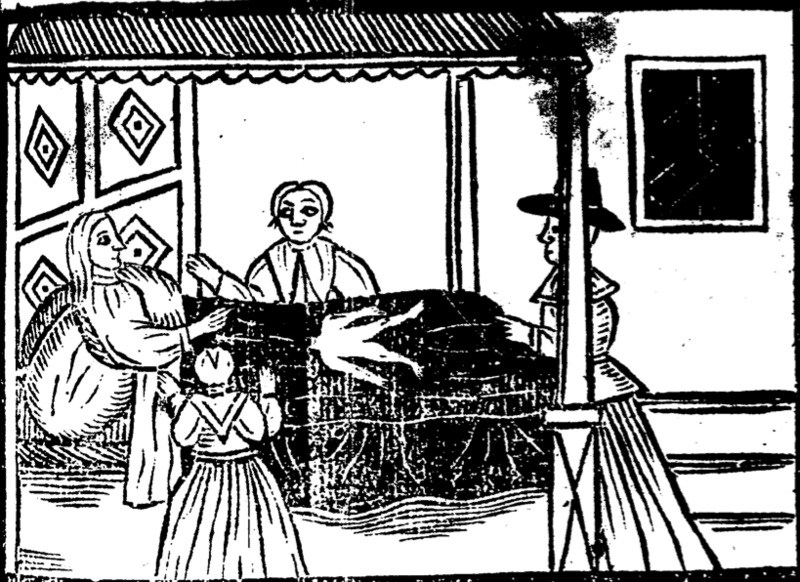 Remember though that this was 1642, before years of war that would lead to the king actually having his head removed. This is satire, albeit rather prophetic. 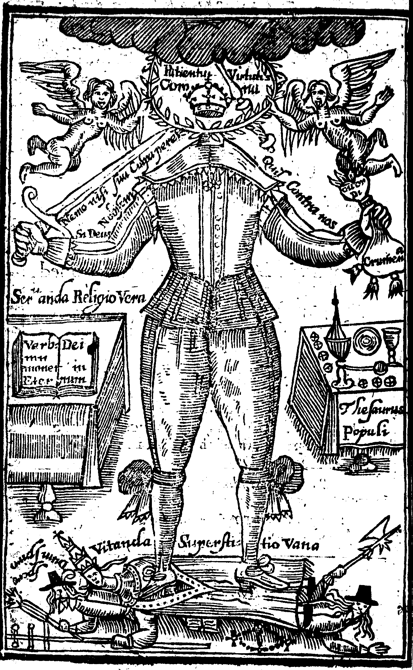 The body is clothed in a finely decorated fitted doublet and breeches, falling band and cuffs with lace edging, hose and open latchet shoes. He is trampling on a typical many headed royalist monster, the heads represent a rebel, a cavalier and the Pope. or, A most learned oration disburthened from Henry VValker, a most judicious … iron monger : a late pamphleteere and now, too late or too soone, a double diligent preacher : as it might be delivered in Hatcham barne the thirtieth day of March last. Taken in short writing by Thorny Ailo ; and now printed in words at length and not in figures. Printed in London 1642. Henry Walker started as an ironmonger in London and gradually moved into writing and selling books from the City. He was also known as a charismatic, though not necessarily learned preacher. Interesting to note that this lecture was taken down in shorthand and then translated into print for publication. Some of the most popular sermons were reprinted in the 1640s particularly, though it was a required skill to pay attention and remember the sermon you had attended, every much as it was for the sermon giver to deliver from memory. 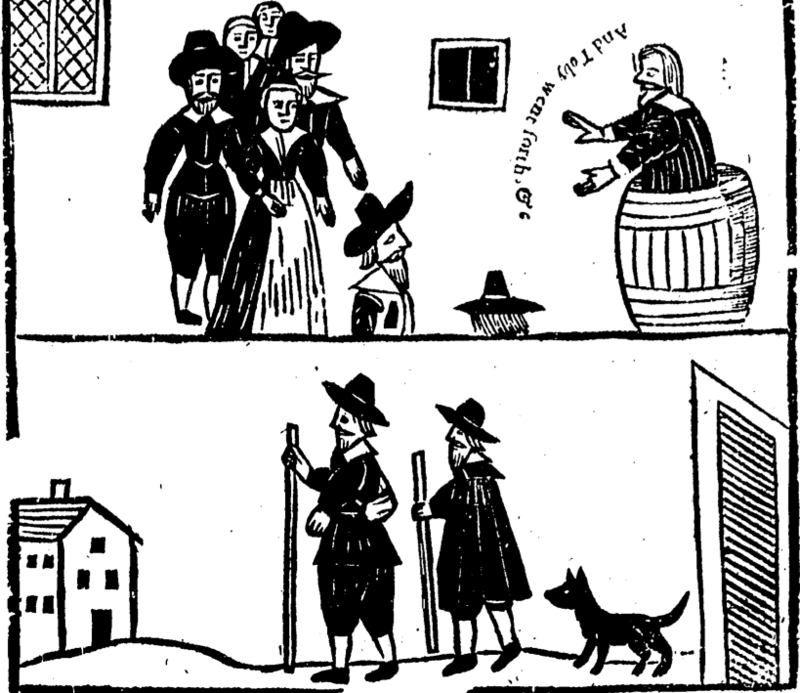 In the top image from the pamphlet we see a group of respectable citizens paying close attention to Henry in his tub. Henry wears a preaching gown and falling band, whilst his flock are tidily dressed in doublet, breeches and fine linen. The ladies in petticoat, apron and kerchief. All apart from the preacher are wearing hats, though it was thought that it was best by those of an independant persuasion to uncover to hear the word delivered. In the lower pane two gents are seen abroad in cloaks and carrying staffs. Perhaps they are pilgrims, or maybe a scene from the parable of Tobias and Gabriel he relates in the sermon. If you want to learn more about Henry Walker, the best place to look in is Nick Poyntz’s blog Mercurius Politicus. 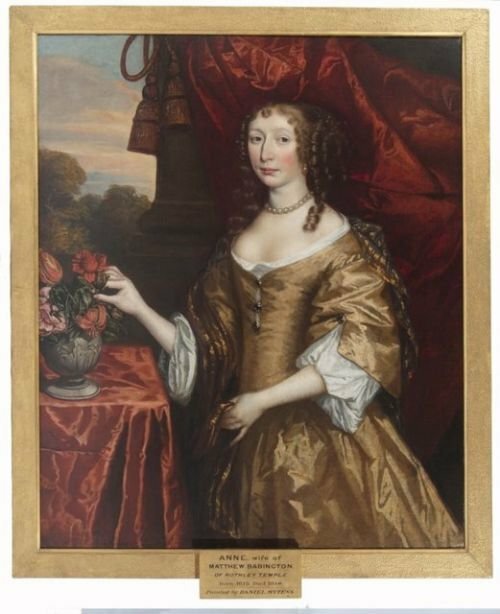 Painted in or around 1643 this picture has been attributed to Theodore Russell. 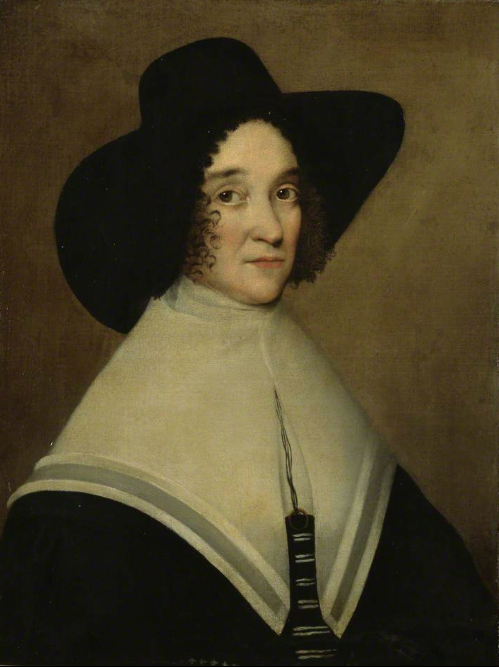 Catherine was the wife of Lord Brooke the prominent parliamentarian and general who was killed by a royalist sniper whilst directing the siege of Lichfield. 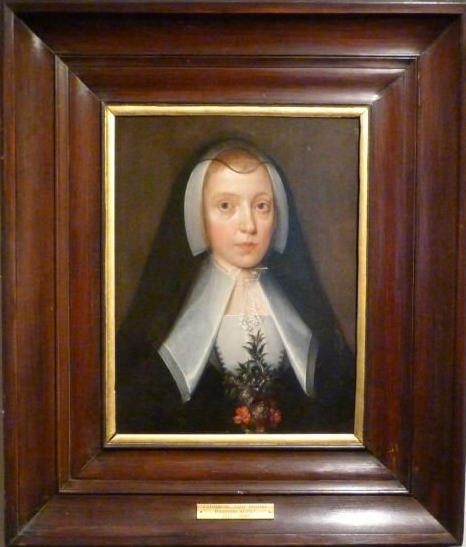 This portrait must have been finished after his death as Catherine wears widows weeds and holds a posy of significant flowers. 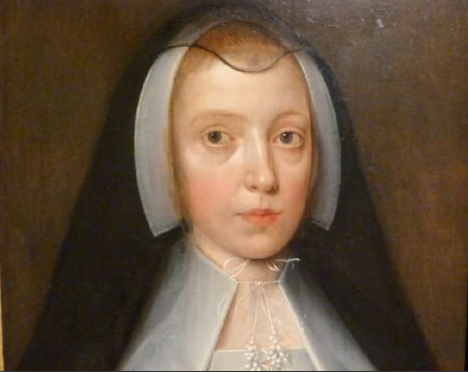 She is wearing a black bodice over a white linen smock with a doubled kerchief which is tied at the throat with bandstrings and a gossamer-thin black linen hood or chaperone on her head. She also wears a white linen coif tied with strings under her chin. Picture courtesy of Roy Precious Antiques and Fine Art. It’s still for sale as as the time of posting. 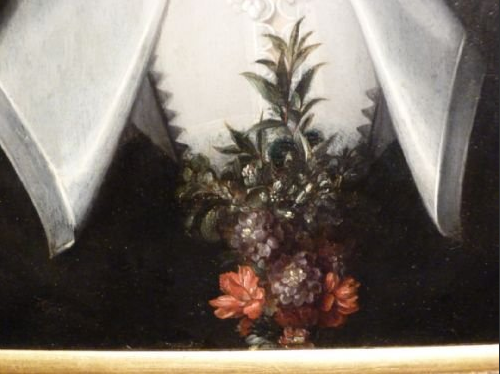 The posy included pink laurel which was associated with honour, triumph and eternal life. I think there may also be some rosemary here for remembrance. I’m not sure what forms the pinked black edge to the bodice. It looks like a very fine black linen but if it’s part of the bodice it’s tricky to tell. Notice how white and fine her linen is though. This was a wealthy lady. This close up shows the ties used to keep her coif and kerchief in place. Interestingly you can also see the top of her smock which is much lower than the neck line of her kerchief. Usually both are of about the same height, but in this case the kerchief is tied very high up her throat.